Copperhead (Agkistrodon contortrix) snakes are venomous snakes that live mainly in the eastern and central United States. Sometimes copperheads are confused with other snakes. Nicknames for copperheads include copper adder, red adder, hazel head, poplar leaf snake and highland moccasin, among others. Once you know what to look for, you can learn how to identify the copperhead snake. Copperheads are bulky snakes and reach up to about 3 feet in length in maturity. Their eyes have slit-like pupils similar to cat’s eyes. They sometimes vibrate their tails, but mostly they remain still and in a coiled position to ambush prey. Copperheads can swim if necessary. Copperheads are pit vipers. The copperhead snake’s head possesses a pit in its face that detects heat. This can help them locate prey in dark passages or at night. They can even tell the general size of their prey at night! Copperheads bite their prey, and their fang venom breaks down red blood cells in the prey to immobilize it. Depending on the kind of prey they pursue, copperheads can adjust their venom supply. Copperhead bites often happen when someone steps on one of the snakes or otherwise touches. While the bite of a copperhead is venomous, it rarely kills humans. Generally, copperheads do not want anything to do with humans. Despite this, do not ever bother a snake if you do not want to be bitten! The copperhead snake skin pattern on its back is also an immediate indicator of the species. Repeating, hourglass-shaped bands make up the copperhead snake skin pattern, which is tan and brown to nearly black in color. The rest of copperhead snake skin is copper-brown in color, which helps to shield the copperhead in leafy habitats. Copperhead snakes in more mountainous areas tend to have more black flecks on their bodies. How can you tell a juvenile copperhead from an adult one? One difference is that baby copperheads are, of course, smaller than adults. Generally, baby copperheads range about 7 to 10 inches in length. They are grayer than adults. Baby copperheads strongly resemble the adults, with one distinct difference. The color of the tail tips of baby copperheads is vivid yellow. Scientists think this pointy yellow tip attracts potential prey, as the tip mimics a moving worm. Since young copperheads eat slightly different foods from adults, having the yellow tail comes in handy. The young copperheads outgrow their yellow tails near maturity at three or four years old. Even baby copperheads can produce a venomous bite as powerful as an adult’s. Adult copperheads will mate generally in the spring, every other year. Some of the males may fight each other during this time. Males search for females by scent via their tongues, sometimes over great distances. Then males will court and mate with females. Copperheads will grow in eggs inside their mother’s body for three to nine months. The females give birth late in summer to early autumn. Copperheads are viviparous, meaning they are born alive, hatching inside their mother rather than hatching from eggs after birth. In rare cases, snakes can be born from unfertilized eggs (this is called parthenogenesis). A brood of copperhead young can range in number from seven to as many as 20 snakes. Larger females tend to have more babies. Copperhead mothers do not linger to take care of their young. Copperhead young lose their yellow tips, and when they reach adulthood, they can be as long as 36 inches. Male and female copperheads differ in size, with the males being larger, while the females can be longer. The teeth of copperheads can be replaced over time. Copperheads can live to approximately 18 years. What Do Copperhead Snakes Eat? Copperheads are carnivores. Their choice of prey is vast, however. Copperheads eat frogs, lizards, other snakes, insects, mice, voles, chipmunks, squirrels, shrews, skinks and even some types of birds. Of the insects copperheads eat, cicadas are their favorite. They also enjoy caterpillars. Copperheads prefer to lie in wait to ambush their prey. If the prey is small, they can be swallowed whole. Baby copperheads favor invertebrates such as insects. The copperhead does not have many predators in the wild, although birds of prey have been known to take them. The top threat to copperheads is humanity. People kill many copperheads outright, or they may perish from vehicles on roads every year. Copperhead snakes prefer wooded locations, often near a body of water. This way they can be close to any prey that visits the water. Copperheads like protected areas like woodpiles, deteriorating stumps, large stones, and human structures like walls and deserted old barns. 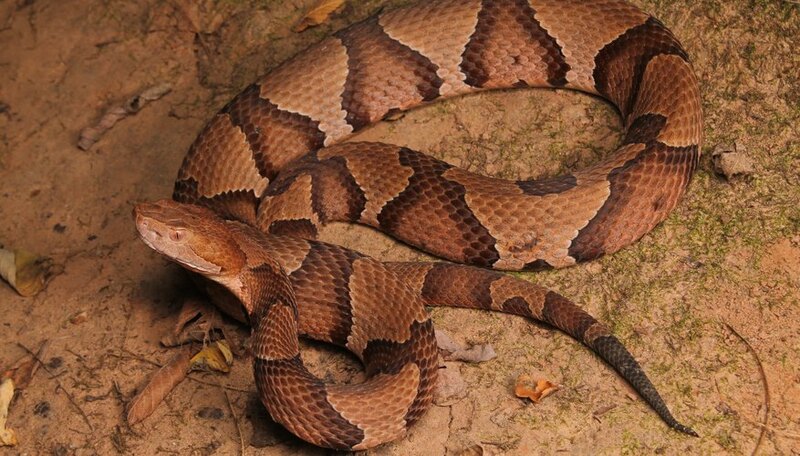 Copperheads favor rocky areas and hardwood or mixed hardwood and pine forests, and the higher elevation margins of swamps. They easily adapt to more urban locations. Living near human settlements gives them opportunity for shelter all through the year. Copperheads relish basking on warm rocks in cool weather, but they retreat during the day in summer. Copperheads are diurnal, meaning they are daytime animals, but occasionally they do hunt after nightfall in the warmer months. While copperhead snakes like abandoned human buildings, they will not typically enter any that are occupied. Copperhead snakes serve as one of nature’s pest controls. They keep the populations of rodents from exploding, and so help aid people’s crops from being eaten by too many rodents. Without copperhead snakes, rodents would increase in number and could be a greater risk to public health. So it is a good idea to leave copperheads to do their natural work in peace. They can be relocated by a professional if need be. Copperhead snakes are social snakes that make dens to survive colder seasons. These dens can be found underground. Many dens will exist on the sides of south-facing hills, which get more sunlight and warmth. 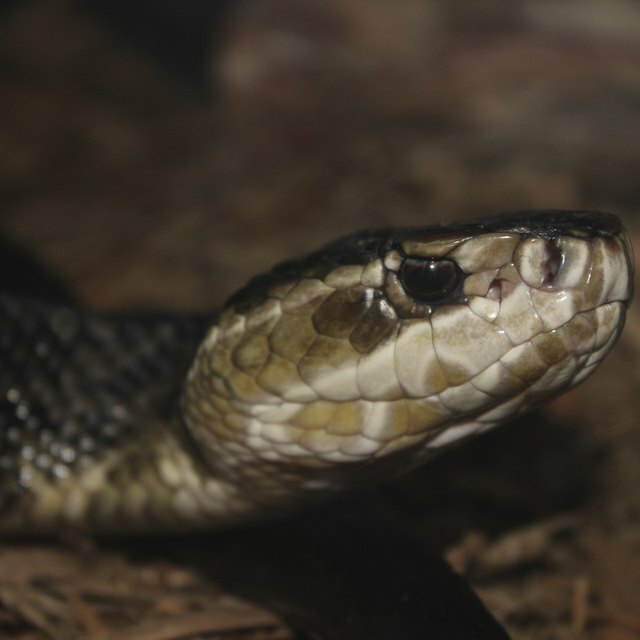 Not only will they share dens with their own kind, but also with other kinds of snakes, such as black rat snakes and timber rattlesnakes. Copperheads like to use the same dens every year. The dens can contain many snakes. Copperhead dens tend to be found in more mountainous areas. Copperheads in coastal plain and piedmont areas do not display as much social den behavior. Corn snakes possess several different colors, such as orange, brown, red and gray, with some black and white or yellow and white on their undersides. Some observers may confuse a corn snake with a copperhead. Corn snakes, however, do not share the copperhead snake pattern. They have less distinct brown blotch patterns. Corn snakes are also not venomous and do not exhibit aggressive behavior. Other snakes sometime confused with copperheads include eastern rat snakes (which are harmless) and northern cottonmouth snakes. It is wise to learn copperhead markings (as well as other snake markings) to be able to tell those that are venomous from those which are not. Still, these other snake species do not have the copperhead snake skin patterns. There is no true copperhead lookalike. Only the copperhead boasts the hourglass snake skin pattern. Dianne, J.. "How to Identify the Copperhead." Sciencing, https://sciencing.com/identify-copperhead-4549967.html. 26 October 2018.